Note: this was going to be a single post, but when I wrote it in Word it was 5 pages of text, and I decided that was too much for 1 post. Here are items 1-7; items 8-14 are in Part 2. I want to offer some thoughts on spindle-spinning and learning to do so, because I have some ideas that may be useful for beginners. Note that these are only my opinions and thoughts. There are many other spindle-spinners out there who are far more experienced than I, and they may disagree with what I write here. Good; please leave a comment so I can learn from you. I have a preference for high-whorl spindles. Bottom-whorl and supported-spindle users are on their own. In addition, there are no instructions for “how to spin”. In my life, it’s just me. I can’t spin and take pictures at the same time, and -as is true of many topics- one can write many, many words to explain something that can be shown in a couple of pictures. (And then there’s the problem that some things can’t be adequately explained in text or in still pictures anyway.) It’s best, in my opinion, to get some 1 to 1 instructions from somebody knowledgeable. 1) Get a good tool. There are many spindles out there in various price ranges. They vary from a drawer pull-knob on a stick to individually hand-turned and finished pieces made from beautiful wood, bone, antlers, clay, glass – you name it – nicely decorated and painted. There are beautiful and expensive spindles that are lovely to look at, but which don’t perform well. There are good, basic, plain-looking tools that perform fabulously. There’s everything in between. Remember that you are not buying a decoration: you are buying a tool that you will use, so get one which performs well. I am not saying that aesthetics are unimportant; most spindle-makers know this and work to build well performing tools that look good. However, many spindlers have been frustrated by a poorly designed tool that looked good, for which they paid $$$. I myself have one of these that I use as a Christmas decoration. The parts of a spindle are the hook, the whorl and the shaft. Good spindle makers think long and hard about the best shape for each of these components. Here’s a picture of 2 rim-weighted whorls, shot from above. (click to enlarge) The one on the left has had wood cut out, so solid wood is on the outside of the whorl. The one on the right has had wood carved out of its centre, so you’re looking down into the depression created by that carving. 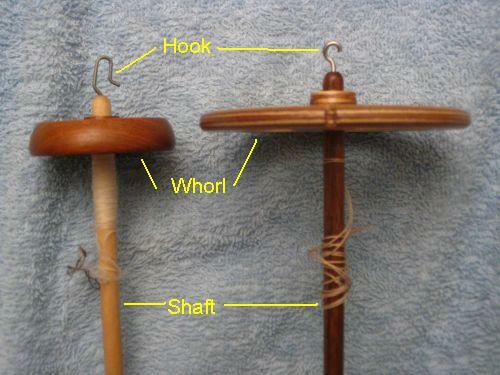 Note that both whorls have a notch carved in the edge to guide the yarn up to the hook. This is a side-view picture of 2 centre-weighted whorls. (click to enlarge) I was given these spindles by someone who couldn’t get them to work and gave up on them. So did I. Note that in both these spindles, the mass of the whorl is centred around the vertical axis running up through the spindle’s shaft. 3) Spindles come in different weights. There is a strong connection between the weight of the spindle and the thickness of yarn it will tolerate your spinning. If you try to spin thicker or finer, you will have performance issues: weird things happening to the spindle’s spin like wobbling or gyroscoping or “dancing”, or the single will break. The heavier your spindle is, the faster your arm will get tired from holding it up. Choose your spindle weight based on the thickness of the finished yarn you want, recognizing that you will likely ply the yarn as well. There is, however, a range for each tool. My 1.33-ounce spindle will spin singles which, when plied, I can use for lace (2 ply) or socks (3 ply). Or, I can spin thicker and make a 2-ply to use for socks. 5) How many do you need? Most spindlers have several, each a different weight, for spinning thicker or thinner yarns. If they’re really hard-core, they’ll get a supported spindle, like a tahkli, for spinning very fine threads or very short fibres, like cotton. As a beginner, you only need one good spindle to get started and for spinning your first few miles of yarn. If you are buying your first spindle and you have a choice between 2 tools which perform equally well, and one is 0.4 ounces heavier than the other, don’t get all uptight about which to get. It’s more important that you get a really well-performing tool than to worry about getting an exact weight. Besides which, an experienced spinner who understands twist, fibre preparation, drafting, fiber types, etc, will spin a wider range of yarns more successfully on a single spindle (within reason) than someone with no understanding of these matters but who has 60 spindles. In other words, before you run out and buy another spindle, buy a lesson or a good book and learn about the craft. 6) Beware the “Boat Anchor”. This is a term given to poorly designed spindles: they’re usually heavy, shaft-weighted, without a good hook and no notch in the edge of the whorl. I’m not seeing many of these anymore. I think the standards for spindles have come up hugely in the last 10 years, and we’re generally seeing better spindles available. 7) Beginning spinners should use good quality fiber when learning. Don’t make the mistake of buying inexpensive, bargain-basement stuff because you’re only learning. (Unless it’s good quality, inexpensive bargain-basement stuff.) If it’s poor quality, you’ll spend too much time and energy fighting with the fibre and you’ll get frustrated – while likely not realizing that the problem is not you, it’s the fiber. What to start with? I’m probably not a good person to ask, because I started with dyed bombyx top – that’s combed silk. (I bought it because I liked the colours.) People tell me that silk is too difficult to learn with, but I didn’t know any better. (Cotton, apparently, is also very difficult to learn to spin with, but that didn’t stop generations of children in India.) After silk, I moved to merino top –because I liked the colours– which is also supposed to be difficult for a newbie to spin. With your 1.5 to 2 ounce spindle, some carded corriedale is probably a good place to start: I know many spinning teachers who recommend this. Top (combed fiber) is considered to be too slippery for beginners. You want to look for fiber that is free of vegetable matter (grass, twigs). It should look relatively light and airy, and should draft easily when you test it. No felting, and if you have to tug to get it to draft, you won’t enjoy working with it. Ask the vendor how to test fiber this way, if you need to. If you want more guidance and have no-one to ask, phone a reputable vendor, tell them how heavy your spindle is, and ask for a suggestion. Remember that they want you to have a good experience. And beginning spinners can go through a lot of fiber very quickly, so if the vendor recommends you buy a pound, don’t protest. Comments on what’s here? I hope so. Thank you for explaining why the boat anchor I got years ago was so daunting. I may look for a proper spindle and try again. The link to Jim Childs' website was also very helpful. Hi Ted, sounds as though you had a great time at Rhinebeck with all the gang. Recently, I was given a spindle made of a CD and dowling. I haven't practiced much with it because of shoulder problems, but it seems very light to me. The woman who gave it to me was able to spin beautifully with it. I'll take your advice and just practice. ps This is my first attempt at spinning. Oooh! I'm so happy to have clicked through from somewhere else. Thank you for writing and posting this. I bought my first/only spindle at MS&W in May and i've been quite intimidated, looking at it...sitting in the basket with the bag of roving. Sigh. Dave over at Cabin Cove has been very encouraging and i did bust out the spindle once...it didn't go so well. I'll try again. I promise! Thank you for your generous posts. I have a wheel but no spindle (yet!) and you have given me many clues to get started. According to the article, since a center-weighted spindle would spin faster, it might be a good choice if you were working with a fiber which required more twist. (I can't verify it personally, since I don't have a center-weighted spindle myself). I can hardly belive this. Just this evening I posted on my blog that I'd been inspired by all the Rhinebeck bloggers & their wonderful knits that were hand-dyed, hand-spun, hand-knit from their own pattern & proudly worn. I want to learn to spin with a spindle. I posted that I think most of my problem is the crappy spindle that came with the kit that but I needed to do some research. And here you are! I think this means that the student is ready for the teacher. THANKS! I think t might be right - that you would want a shaft weighted spindle for something that would create a quicker turn and a more firm twist. I would think it would be really good for something like silk of cotton - but I'm not sure. I was in class this weekend and Merike Saarniit was hesitant to suggest spindles to work with as a beginner - but my first spindles were an Ashford (which I don't much like - too heavy), a Bosworth (which i like plenty but can't find), and a Hatchtown (which I love and use most often - tho the fact that there's no notch is a tad annoying). Great post - looking forward to reading pt 2! I think that the concept of the shaft-weighted is to have a fast-spinning 'straight-spinning' spindle that doesn't try to "helicopter off". That doesn't really work that well in practice, though. As you've found. The spindles I make and use are generally 'edge weighted', but not as heavy as what you're recommending (.75-1 oz). Some are more or less balanced as to weight (neither edge weighted nor shaft-weighted), and behave more like the 'cd spindles' people make. A good fiber for beginners is Bluefaced Leicester. It spins easily and is very soft and you can get it in a variety of colors. Make sure you get Bluefaced and not Border or some other Leicester if you want the soft feel. A center weighted spindle would be used for very fine laceweight with a short staple where you want the spindle to spin fast. Problems with center weighted spindles arise when people try to make yarn that is too thick for them, and the spindle stops too quickly. If you are making the right size yarn, center weighted spindles can be the perfect tool. Center weighted spindles are more often used as supported spindles, but you can also use them as a suspended spindle. There is a third category other than center or rim weighted, and that is evenly weighted. A lot of spindles fall into that category, including CD spindles, Mongold spindles and many other flat whorl spindles. Just great info - clearly written too. I have one spindle which has the weight around the center of the whorl and that is my Priscilla spindle. However it is a lap spindle - so explains it. It spins well suspended too - I learnt to spin on it and then I fell into the arms of Bosworth . Hatchtown are hard to come but I tried.